"Is my saw worth tuning up?" "How do I choose the right saw and configuration for my needs?" With the launch of my Bad Axe saws, my lead time for turning around the tune-up of a vintage saw has lengthened, and I'm trying to steer away from doing the kind of grunt work anyone can do on a DIY basis. 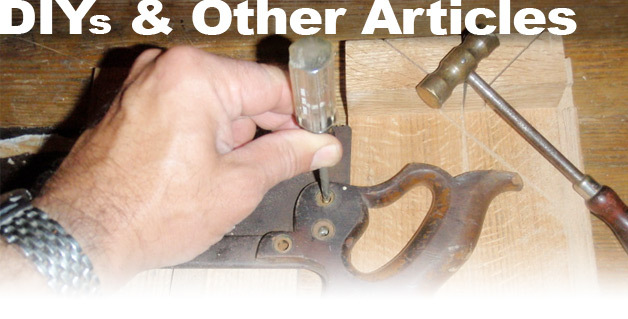 So—to facilitate servicing your vintage saw, I thought I'd post these DIY procedures that will enable you to clean your sawplate, repair your handle, unlock frozen sawnuts/bolts, and prepare your saw for shipment. That way, you spend less money on a tune-up, and I can focus on sharpening and straightening your saw. As many of you are expert woodworkers, please do feel free to comment on any of these procedures if you spot something that can be done more efficiently.